Explanation: Did you ever have a day where everything got turned around and you just couldn't tell which way was up? 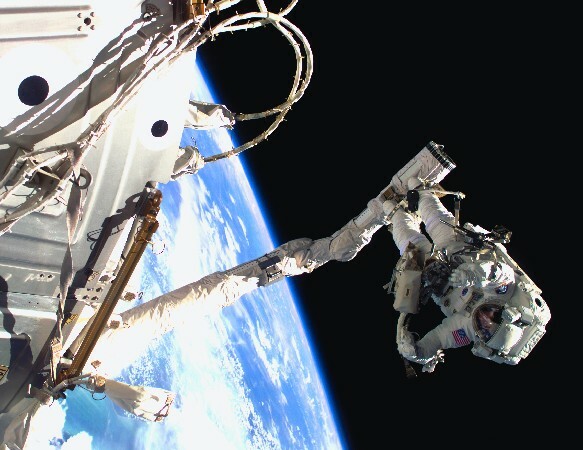 Fortunately, this didn't happen to astronaut James S. Voss on May 21, who spent six hours preparing to fix and upgrade the International Space Station. Voss is shown above anchored in the clutches of Space Shuttle Atlantis' mechanical arm, maneuvering outside the shuttle's cargo bay high above planet Earth. 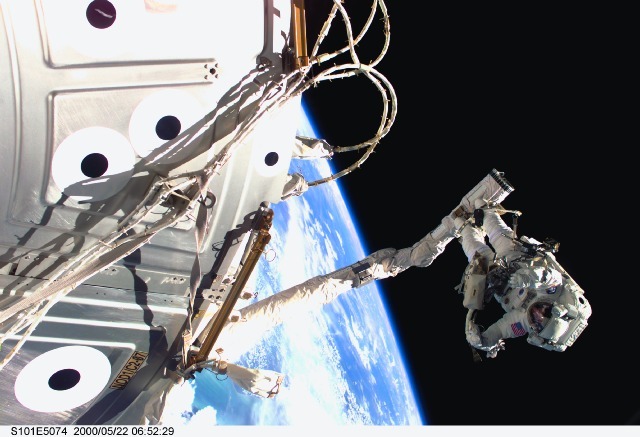 This space walk was the 85th in US history and the fifth dedicated to the construction of the International Space Station. The STS-101 mission returned early Monday morning after successfully replacing the station's batteries, lifting the station into a higher orbit, and replenishing needed supplies. In several years, when the International Space Station is complete, a crew of up to seven astronauts will live and work in a volume similar to a 747 jumbo jet.